Depending on the goals to be achieved, there are many ways to calculate a company's profits. This is to a great extent due to the different aims of financial and tax accounting. Financial accounting is undergoing a growing influence of IAS/IFRS. IFRS is also exerting a growing influence on tax accounting. This is especially visible in the European development of a Common Consolidated Corporate Tax Base (CCCTB) for multinational corporate entities. Although no formal link exists between IAS/IFRS and CCCTB, IFRS will likely be a strong material influence on various key elements of the CCCTB. Many tax professionals (and Member States) fear the influence of IAS/IFRS on tax accounting mainly given the divergent aims of IAS/IFRS and tax accounting. The introduction of IAS/IFRS will have significant consequences for tax accounting, disclosure and corporate law accounting concepts in individual Member States. Since IAS/IFRS is strongly influenced by the Anglo-American view on accounting, a question arises regarding its potential influence on the various continental disclosure, tax and financial accounting systems. In other words, one can readily envision a confrontation of systems with totally different backgrounds. 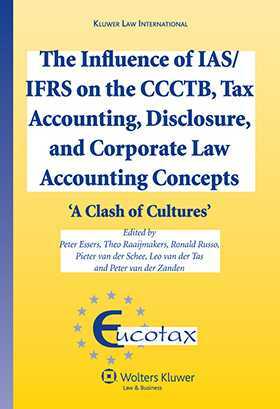 This insightful work focuses on the consequences of this ‘clash of cultures’ for tax accounting, disclosure and corporate law accounting concepts.